The Great Himalayan National Park is dwelling to a number of rare and threatened species which includes chir pheasant, snow leopard, Himalayan musk deer and tahr, Asiatic black bear, blue sheep and serow. Several threatened plant species of IUCN Red-list are found in the park too. 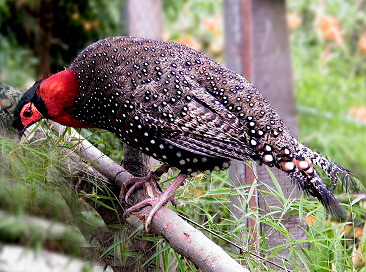 western tragopan which can be seen during jungle safari and bird watching. Permits can be obtained from the Park Director at Shamsi or Range officers at Larji, Sairopa, Banjar or Sainj for tourists to enter the Park. Vehicles are not allowed inside and the visitors have to go along with the guide which is mandatory on foot.